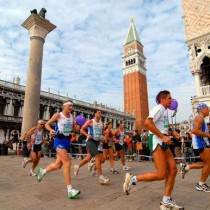 The Venicemarathon, now in its 34th year, has earned a place among the most important events of the city. It is a sports event of international standing, attracting over 6,000 runners from all over the world every year. The marathon is held over the official Olympic distance of 42,195 kilometers (26,224 miles). The course is flat and basically downhill. It starts from Stra and runs along the River Brenta, passing in front of the magnificent Palladian Villas of the area. The runners arrive in Venice via the Liberty Bridge, which links the mainland to the city. After crossing a floating bridge 400 feet long over the Grand Canal which leads to St. Mark's Square, runners reach the Riva dei Sette Martiri in the picturesque waterfront of Venice where the finish line is located.